Since You’ve Been Gone has some great music playlists, a pretty epic to-do list, and proof that you should always expect the unexpected. *This is book #20/35 for my 2015 book challenge. You can take a look at the reading challenge here. It was Sloane who yanked Emily out of her shell and made life 100% interesting. 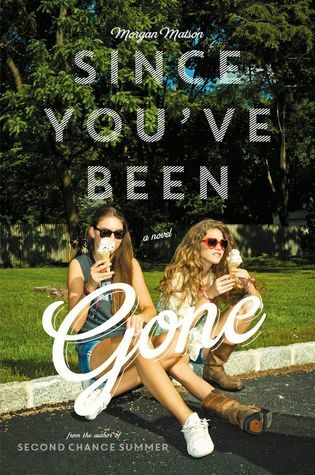 But right before what should have been the most epic summer, Sloane just…disappears. All she leaves behind is a to-do list. On it, thirteen Sloane-inspired tasks that Emily would normally never try. But what if they could bring her best friend back? I really, really enjoyed this book. I took some time after reading it before reviewing because I genuinely missed the characters, and I felt like I needed time to grieve their absence. Morgan Matson has written a lot of books like this one, including Amy & Roger’s Epic Detour, in which she lets the story end as it does and never promises a sequel. Which is cool, because she does the whole Sarah Dessen thing where the characters and places kind of pop up in the other stories, but is also really sad because you grow attached to them and want to see what happens to them next. I’ve come to realize that the books that I write the least amount of updates for on Goodreads are usually (but not always!) the best books. I was so enthralled with this one that I never really felt the need to stop reading to make a note of something. I really love when authors can create complex, flawed characters – especially when it comes to contemporary fiction. I want to be able to understand and relate to them, or at least understand their motives. I really enjoyed the character development in Since You’ve Been Gone and while a lot of it was set up to be a bit too easy on Emily, it wasn’t enough so that I was disinterested.